While the rain has slowed the yellow jackets down quite a bit, I have no doubt that as soon as we get the next sun break, they will resume harassing my hives. This simple robber screen does an excellent job of keeping most raiders out. The screens are easy to make from inexpensive materials and are well worth the effort. 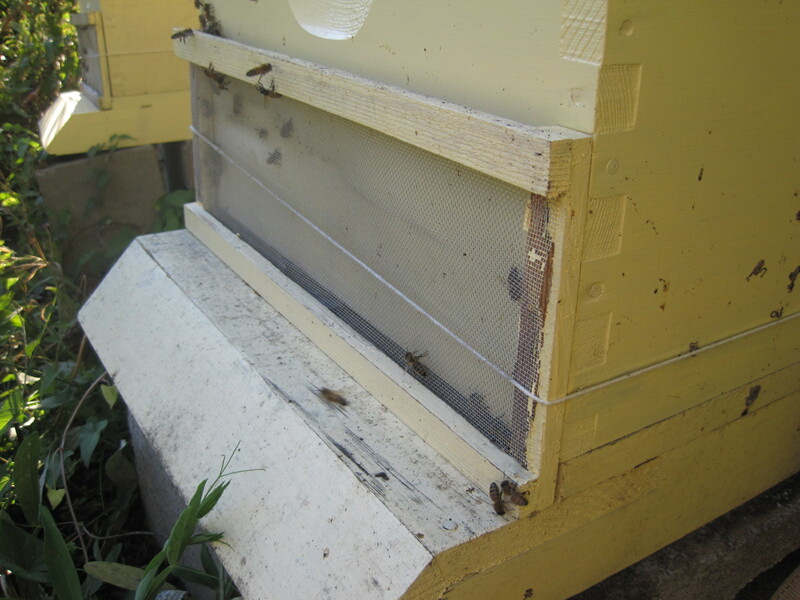 Mine are tied on with a length of cotton garden twine–I’m squeamish about making unnecessary holes in my woodenware and like the flexibility when it comes to changing out hive bodies. The home bees take a couple of days to really get the hang of going down behind the screen and back up into the hive; most yellow jackets and robber bees don’t seem to be able to figure it out at all. I usually install mine in late June while there’s lots of sunny weather ahead, but putting one on even this late may help your bees protect their hard-won stores. Robbing led to the demise of many Lane county hives in last year’s long, warm fall–act now!